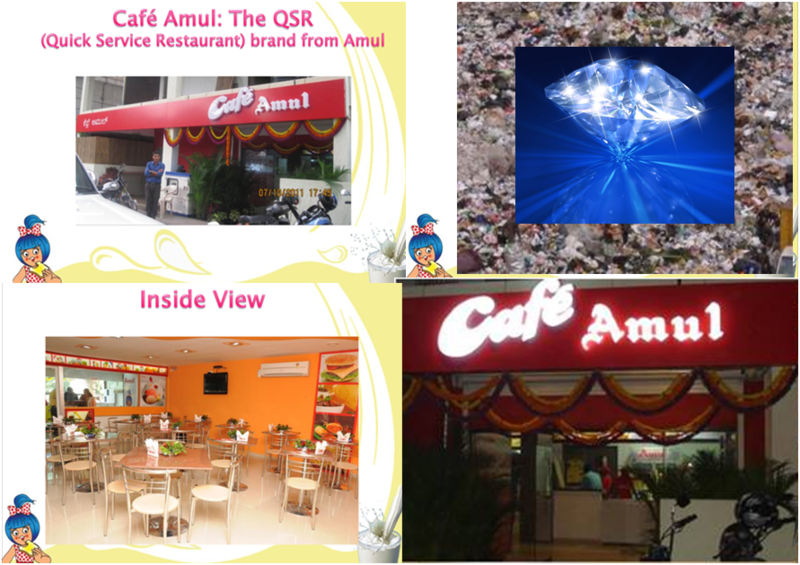 The Restaurant Business in India : Cafe Amul - Is this truly a "Diamond in the Rough" in the Franchising space? I was out with a few friends on Saturday and we wanted to do a quick "Coffee Break", use the rest-rooms, sit and chat for about 10-15 minutes taking a break. Not wanting to spend too much money by going to a Cafe Coffee Day, I took them to a "Cafe Amul" in the area which served coffee for 15 bucks. This was my 5th visit to this Cafe Amul. During all my previous visits, I was not very impressed with the concept and felt that Amul was still experimenting with the concept & format. I was even more shocked to learn that this was actually a franchise. A brand and company like Amul experimenting at a Franchisee's expense - I was disappointed. During this visit, a gentlemen approached our table, introduced himself as a representative from Amul and wanted our feedback on the Cafe Amul concept. I gave him candid feedback and out of curiosity started asking him questions about the Cafe Amul proposition and their plans with it. He mentioned that they have 3 formats - Amul Scooping parlors (simple ice-cream kiosks), Amul parlors without a kitchen (just sandwiches, ready to eat stuff & ice-creams etc.) and then Cafe Amul (with a hot kitchen serving fresh food and snacks). Their proposition was to offer Value for Money all day dining options (Dosas, Sandwiches, Parathas, Pizzas etc.) in a comfortable casual setting. He also told me that the franchise had a lot of flexibility in designing menu options that suited the specific location and those that could be operationally managed. I probed him further on their commercial model and his response stunned me. He told me that Amul did not charge a franchise fee, nor did they have a revenue share. They only required franchises to pay a refundable deposit of 3 lakhs (More details available on their website http://www.amul.com/m/cafe-amul). They of course made money on supplying Amul products to the franchise, but the cost for these products is the same as it is for any retail store selling Amul products and in some cases even lesser. So why was Amul doing this? His response was that this a brand building effort from their side and being a cooperative, they wanted to help entrepreneurs leverage the Amul brand (trust, VFM, good quality etc.). They would anyway make money since their products would be sold and also used in the Cafes. Well, like Juice Junction (see my post on this http://restobizindia.blogspot.in/2011/03/featured-business-juice-junction.html ), this model seems to be almost unreal in today's competitive and cut-throat business world. I sincerely do hope that Amul manages to tweak the offerings (there is some serious work to be done on this - they still seem to be in the experimentation mode) to make Cafe Amul appealing enough to customers to meet the revenue/profitability targets and wish them and all their franchises success. Way to go Amul. Wow! Amazing blog! I love Amul cafe. I was even more shocked to learn that this was actually a franchise. This is so nice and awesome information, i like it. Jayanth - nice, well written article. 1. Investment for Amul cafe is 30L compared to the other franchisee models such as Kathi Zone. 2. ROI estimated is very low and the it might take ~ 4yrs to break even, Any thoughts here? Amazing. this is really nice article to read. Amul cafe has provide pizzas, Amul cheese sandwiches, butter milk shakes and much more things to people. Wow! Amazing blog! I love this blog. I was even more shocked to learn that this was actually a franchise. This is so nice and awesome information, i like it. U have a good amul franchise and i like your services. It's explore online source of franchise opportunities, service providers, franchise business updates and news. Contactnumber.in provides India customer care number of all leading service providers. Thanks for sharing such a nice article. I really like your article. Thank you. nice one to inner view restaurant..
i appreciate that you took a simple, how to article by explaining the process step by step and how to build momentum. Where can one find the best birthday party catering in Bangalore for a child's birthday party? I was just wondering if you are aware of retail invoice software Billing software India Small Business POS India. Either ways keep up the good work of posting. Thankyou Jay for sharing this article with us. Thanks for share this information. Keep sharing and related information shared.. If you are thinking of establishing a franchise you might want to consider working with Majestic Beauty. Majestic Beauty is a well established beauty salon and brand with a proven ten year history. Working with Majestic Beauty to open a franchise in japan also comes with the full support of the their peer network.Before you apply, make sure that a ZED Japanese brand franchise is a good fit with your business goals.